I wrote in my white vase challenge post several weeks ago about there being certain pieces of home decor that I would consider to be staples. I mentioned how the white vase would be one of those items. Well, the tiered tray would be another that is absolutely at the TOP of my list. Tiered trays are one of the most versatile home decor pieces that I can think of. They come in so many shapes, sizes, and finishes that you're sure to find one that fits your design style and budget. The best thing about them is that the styling possibilities are endless! I had actually been searching for a while for the perfect tiered tray when I stumbled upon this beauty at my favorite home decor store, Laurie's Home Furnishings. I was SO thrilled to finally find the perfect one and maybe even more thrilled to find that it was only $68! There is definitely a big price range on tiered trays, but these babies can get pretty pricey, as I'm sure some of you have found. Happily, I found the perfect one for me, and I've had so much fun styling my tiered tray since I bought it last fall! I just wanted to share with you a few of the styling possibilities that I have come up with. Enjoy! 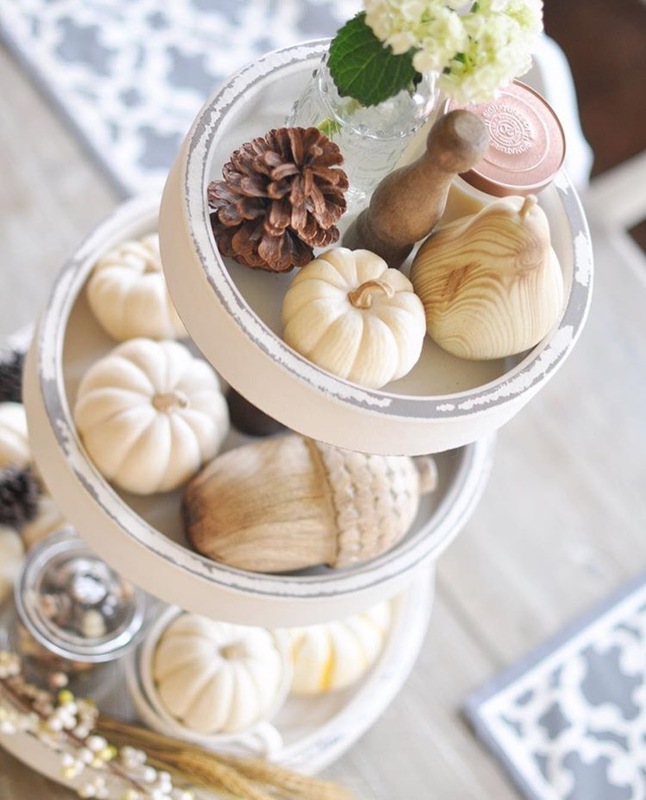 For fall, I styled my tiered tray with baby boo pumpkins, pine cones, acorns, cream colored berries, and decorative wood accents for a neutral, earthy look. One thing that I almost always keep on my tiered tray is the small, lidded glass jar that you see on the bottom tier. It's so versatile, and I can fill it with different things for each season. It's difficult to see here, but it is filled with those adorable cream and copper acorns that the Target Dollar Spot was selling last fall. I'm sure some of you picked up, er hoarded, a couple of boxes of those too. For Christmas, I went more festive with my styling. I mixed my whites with cheery pops of red and cute little Christmas accents like the wooden skis, the old fashioned sled, and the red pickup truck with Christmas trees. Here, I filled my little glass jar with candy canes. To transition from Christmas to winter, I removed the pops of red leaving the items that could transition from the holidays into winter, such as the snowflakes, snow globe, and skis. I then pulled in some of my blue and white pieces for a cool, classic look. Party straws are one of my favorite things to add to my little glass jar. You can find them in a variety of colors and patterns for nearly every season. They're a great little accent and useful, too! I loved decorating my tiered tray for Valentine's Day! This is really the first year that I've done any Valentine's decorating, and I loved all of the cute pieces I was able to find. All that sweet pink and red makes me smile. For Easter, I pulled in lots of pastels and sweet Easter eggs and bunnies for a cute springtime display. Here I gave my tiered tray a very classic look that really could work for any season of the year. This type of look is perfect if you aren't necessarily looking for a seasonal theme for your tray. I really love this fresh, clean style with the white dishes and the fresh hydrangeas and pears for spring and summer! I hope this gave you some ideas and inspiration to decorate your own tiered tray. The possibilities really are endless!